Want to help a good cause, and get a cool game in the process? Shenanigans: The Musical is up on Kickstarter, and helping fund the project also helps The People’s Orchestra, an organization that makes orchestra accessible to everyone, as both audience and performers, regardless of their wealth or status. For a pledge of £10 (around $14) you’ll get a copy of the game and all it’s expansions if the project is funded. So what’s the game all about? We had a lot of fun with this one, and the fact that it doesn’t take as long as similar party games of its styles makes it simple to setup and play again multiple times in a rather short time, cycling players if needed. This makes it great for hectic family gatherings where there’s a lot of kids, and adults, that may need looking after. Shenanigans is simple, humorous, and excellent with large groups. It’s a refreshing take on Mafia/Werewolf style party games, and is much quicker and fluid. 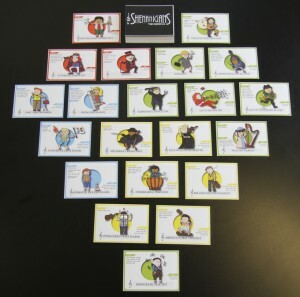 A prototype copy of Shenanigans: The Musical was provided free for preview purposes.